The actual game never gets as heated or exciting as this cover. Truth: not even Sega knows the official dates for SG-1000 games released into the Japanese market. Sega of Japan’s official website only gives the year of release for SG-1000 titles rather than the specific day, month, and year. Thankfully, lack of concrete dates only affected the SG-1000. After the release of the Mark III, Sega of Japan kept relatively excellent track of all their game releases. It will be awhile before I reach the Master System, though, and in the meantime, I still want to review the SG-1000 games in close-to-chronological order. As such, I’m using production code order to guide the reviews. Borderline‘s production code was G-1001, Safari Hunting‘s was G-1002, N-Sub‘s was G-1003, etc. Without the actual release date, it’s the closest I can get to reviewing games in chronological fashion. With this knowledge in mind, we come to G-1004 or Mahjong. The SG-1000’s previous three releases were all arcade ports of varying quality, but Mahjong has no arcade background. It was the (potentially) first brand-new title released for Sega’s first home console. Talk about conservative beginnings, especially for a company like Sega, who would become known for experimentation and throwing exorbitant sums of money and resources to the wind. Sega’s decision to release Mahjong so soon on the SG-1000 makes financial sense, though. Mahjong was, and is, a hugely popular table game in Japan. Making a simple mahjong program for the SG-1000 probably took very little resources, enabling Sega to release it quickly. 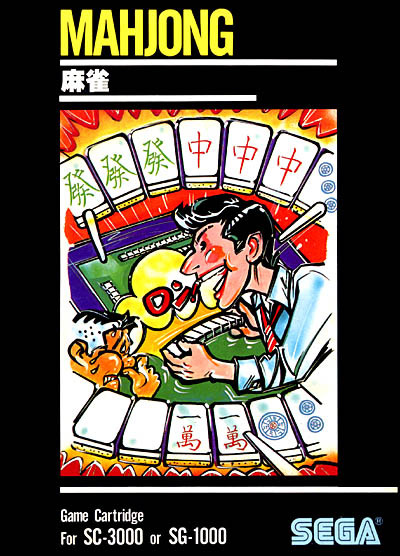 Also, as Jeremy Parish pointed out in his review of the Game Boy mahjong title Yakuman, mahjong interests adults more than kids. By releasing Mahjong as early as possible, Sega broadened the appeal of the SG-1000 to a variety of demographics. Invite your Japanese grandfather over and have a ball! I’ve played easy mahjong variants on the NES/Famicom before, but never pure, unfiltered, six-packs-a-day mahjong until, er, Mahjong. Four FAQs and a headache later, I have a general understanding of the basics, though I still wouldn’t bet on my chances in a competition or anything. The goal of mahjong is to achieve a “mahjong”: fourteen tiles composed of four groups and one pair. A pair of tiles is just two identically marked tiles. A group of tiles consists of either a “pung” or a “chow.” A pung is a set of three identically marked tiles, and a chow is three sequenced tiles of the same suit (like seven, eight, and nine in Japanese characters, for example). The tile sets are emblazoned with dots, bamboo, and Chinese/Japanese characters, with each set consisting of numbers 1-9. There are also sixteen wind tiles, with four tiles labeled east, four west, four north, and four south; and a total of twelve dragon tiles – four red, four green, and four white. Each player starts with thirteen tiles, but is able to pick up a tile from the discard pile (begun by the dealer) at random intervals throughout the game to complete a pung, a chow, or even to win the hand. This is the bare minimum you need to know. If my summation sounds confusing, that’s because there’s no right way to condense all of mahjong into a paragraph. For more on constructing tile walls, dealing, and discarding – all of which are crucial to understanding how to play mahjong, though not necessarily SG-1000 Mahjong – consult this FAQ, which is, hands down, the best FAQ on mahjong that I could find. 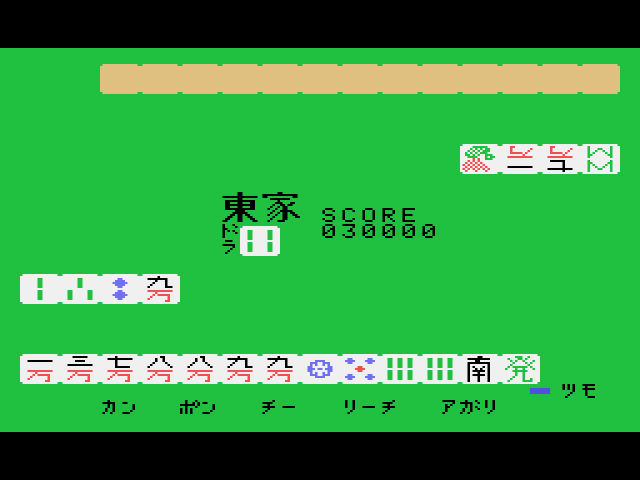 Mahjong on the SG-1000 might be tough for newcomers to the game, like myself. But even with my limited understanding, I recognized that Mahjong was bare-bones tile-shuffling – no variants, no flower/season tiles, etc. – as one would expect from a mahjong title circa 1983. I’d say I understood about fifty percent of the on-screen “action,” but I enjoyed placing what I believed to be the proper tiles in the correct order. Unfortunately, there is no multiplayer option to ease the pain of consistently losing to the computer (the computer, she is ruthless). Despite the losses, once my play sessions had ended, I had a finer appreciation of the game proper – a good thing, since Mahjong is but a drop in the sea of mahjong titles that span across all of Sega’s consoles. Given the chance, I’d rather learn and play mahjong in a smoky, dark room against three elderly Chinese opponents. 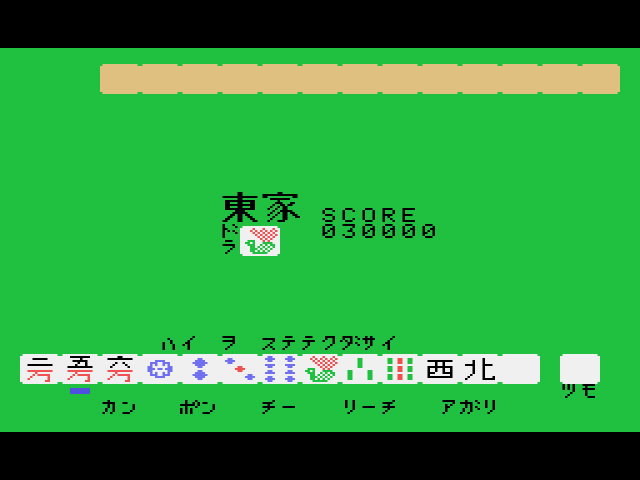 For the time being, SG-1000 Mahjong works just fine. I think when lack of a date, the release code is an exellent idea. They more or less follow release dates except in a few rare instances. IMO better than rounding up all the extra games at the end of the year. To restate my comment from Jeremy’s website – this is a two player, head-to-head version of mahjong, which is much simplified when compared to proper 4 player version (somewhat akin to playing Bridge card game with only two players). There’s also a lot more rules in Japanese version of mahjong, you need more than a valid hand to win the game (at least one yaku, more info here: http://en.wikipedia.org/wiki/Japanese_Mahjong_yaku), whole Richi condition when you declare your hand is ready for additional yaku and can only draw a winning tile from thereon, there’s also a dora (joker) tile for each round. It’s definitely way more complicated than both Chinese and American versions, and leagues more fun than Shanghai is. Also, minor correction – while it’s true that most hands require four threes and a pair, there are few special ones that break this requirement – All Pairs (chiitoitsu), Crap Discards (Nagashi mangan), All Crap (kokushi musou). Hmmm… the FAQs I consulted (from supposedly reputable sources) must be missing information. Thanks for the info. I will likely address this in future Mahjong reviews. Honestly, I think this is the best possible review for this that could be written. Glad you’re back man! Good to have ya back.